Avita Vesnia is an Imperial priestess added by the Knights of the Nine official plug-in. She is found first at the Shrine of Kynareth, where she is involved in the quest Nature's Fury. After the quest is completed, she travels to the Priory of the Nine and requests to become a Knight of the Nine. Once she is a knight her name becomes Sir Avita. 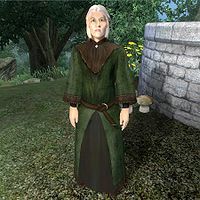 Like her fellow worshippers, Jesper and Stanet, Avita is a true believer in the goddess of the heavens, the winds, the elements, and the unseen spirits of the air, and as such, she spends her entire life near the Shrine, which is conveniently built amid Kynareth's creation, nature itself. When not wandering near the shrine, randomly saying "All are welcome here", she will occasionally sit down on one of the benches between 9am and noon and will also provide lighting to the worshippers as she will always pull out her torch at 6pm, carrying it all through the night. When you have started the related quest by talking to the ghostly reincarnation of Sir Juncan at the Priory, Avita will have a whole new set of special information for you. When you approach her she will say: "What brings you to the Altar of Kynareth, my child?" When you ask her about the Chapel of Kynareth, she will politely explain: "You have been in the Chapel of Kynareth from the moment you stepped outdoors. Have you not felt her presence? We gather here to pay tribute to all of the blessings she bestows upon us." When you finally ask her about the Boots of the Crusader she will describe the challenge you must face: "You would seek the holy relic Kynareth has bestowed upon the world? Then you must prove yourself worthy. Kynareth's creations guard her relic, and you must pass the test before you may be granted the boots." At this point, you may deny her proposal and she will get angry: "No? You would think yourself above Kynareth's design? Then perhaps you should not have come here at all." When you return later, she will say: "You return to Kynareth's Altar. Have you changed your mind? Do you still seek the Boots of the Crusader?" At this point it is still possible to refuse and she will get frustrated: "Why [sic] you insist on returning if you are not willing to do what is necessary?" Lastly, if you are in the middle of battling her beloved wildlife, she will refuse to give you any information until the battle is resolved: "You seek the Boots of the Crusader? Kynareth will show you no favor until your current conflicts are resolved. Finish your fights, then return here." "Fear and respect Nature and all Her Creations." When you finally ask her about the test, she will tell you what little she know: "I cannot say what it will be, for I do not know. Kynareth herself will decide in what manner you shall be tested. All I can do is direct you to the Grove of Trials, and remind you to heed Kynareth's teachings: fear and respect Nature and all Her Creations." When you ask her to elaborate on the “fear and respect nature”-part, she will say: "Indeed. Nature itself is Kynareth's domain, all its creatures are her wards. You would do well to remember this when it comes time for your test." She will also help you locate the Grove of Trials if you ask her for directions: "Not far from here, to the west. Nestled within the Great Forest, it is a place many would overlook. I warn you that it is unwise to take anyone with you. You should go there alone." When you finally accept the task, she will say: "Then proceed directly to the Grove, as your test has begun. Kynareth may choose to guard you along the way; that is up to her. Good luck." If you approach her again, she will repeat: "You must be tested by Kynareth before you are worthy of the Boots." Should you fail the test, you must return to Avita for another chance; she will start off by welcoming you: "Welcome again to the Altar of Kynareth." She will then provide a second chance and add: "I see it on your face; you have failed the test. In her infinite Grace and Wisdom, Kynareth will have mercy on you, and allow you to resubmit to her test. 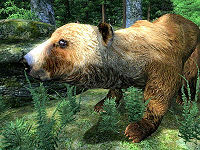 Return to the grove and try once more." After you have passed the test and opened Kynareth's Grotto, she will, if you have not yet picked up the Boots, guide you in the right direction: "You have passed Kynareth's test. The Boots are yours for the taking. They await you in the Grove." When you pick up the Boots, Avita will, in her own words, receive a "divine vision from Kynareth herself" and leave the Shrine. The determined worshipper will then travel all the way to the Priory of the Nine in the West Weald; she will go down the hill and hit the Red Ring Road, then head west on the Gold Road. Before she reaches Skingrad she will head south on the unmarked road near Bloodcrust Cavern and continue all the way to the Ayleid ruin of Silorn. She will then head into the wilderness for the rest of the trip and will typically arrive to the Priory after 12 hours of traveling. At the Priory, she will wander around the ground floor all day and only sleep between 6pm and midnight, eagerly awaiting your arrival. When you approach her, she will offer to become a full-fledged member of the Knights of the Nine, and claim that Kynareth herself told her to do so: "We meet again. I am here to join your Order, having received a divine vision from Kynareth herself. I have been shown that to protect all Kynareth's creations, I must take up your cause and be willing to lay down my life for you. So here I am. I have no doubt that our good works will be talked of in the eras to come." If you reject her, she will keep up faith: "I see. I will not be deterred, so I shall remain here in the hopes that you change your mind." When you accept her proposal, she will gratefully say: "Thank you. I shall serve the Order to the best of my ability. I must change into something that suits a knight. Please, excuse me." She will then head down into the basement and take off her green robe and quilted shoes and instead slip into a set of appropriate light armor, including the Knights of the Nine Cuirass paired with a set of regular Chainmail armor, including a pair of gauntlets, greaves, a helmet and boots. She will also pick herself a leveled but unenchanted bow with two iron arrows and five silver arrows and a longsword of the best possible quality. When attacked, she will block with the special Knights of the Nine Shield. She will, at all times, carry a random amount of Restore Health potions to aid her in combat, along with a hoe, she will start using after Umaril the Unfeathered is defeated. She will wear her new set of armor all day long, but will still wear her old robe when she goes to bed or when she works the land. While waiting for you to gather all the Crusader's Relics, Sir Avita will live her life at the Priory trying to improve her skills and get acquainted with the other Knights residing at the Priory. She goes to bed early at 9pm and sleeps for six hours, then heads into the basement where she hacks away on the training dummy until 6am. She then heads upstairs where she, due to a bug will stand still facing the wall for three hours. At 9am she crosses the courtyard and enters the Chapel of the Nine for three hours of peaceful praying. At noon she returns to the Priory for a bit of wandering before her only meal of the day at 3pm. She spends the last three hours of the day on the ground floor before she goes upstairs and finds her bed at 9pm. When you have collected all the Relics and finished the Sword of the Crusader quest, Sir Avita will, along with all the other Knights, relocate to the Chapel of the Nine and listen to The Prophet's ramblings until you interrupt the service. Once you initiate the final quest by receiving the Blessing of Talos, Avita will run all the way to Garlas Malatar west of Anvil and await your signal to launch the attack. During the attack, she will run headfirst into the ruin and fight the many Aurorans in order to clear the path for you. Like the other Knights, she will disappear when you touch the Dark Orb in the second zone of the ruin. When you return to the Priory after the final battle against Umaril, you will find Avita lined up with the other surviving Knights in the courtyard, listening to Sir Thedret's final speech. When all is said and done, she will return to her life and daily routines at the Priory and will offer to aid you in battle if you approach her. With Umaril's death, the Priory will be completely restored and Avita will experience a few changes; at 6am, her chair is finally found on the second floor and she will sit down and read for three hours. Also, since the vegetable garden is now flourishing, she will spend three hours tending it with her hoe, starting at noon. If Avita dies during the final battle against Umaril, the surviving Knights can be heard moaning about their loss: "Do you ever think about Sir Avita? Her death... I wish it could have been me instead of her, is all." and "I was just thinking about Sir Avita. Sometimes I forget she's gone, and wait to hear her laugh from across the Priory... then I remember." Avita joins the Knights of the Nine faction after completing the quest Nature's Fury. Since Avita is in the Creature faction, she will not attack anything else that is in the faction; including Creatures, Vampires, Necromancers, Goblins and Undead. It is possible for Avita to be stuck permanently following you if you trigger the KotN follower bug; see bugs for details. Avita's fixed chair is not available at the Priory before Umaril is defeated at the end of the quest line. This will cause her to stand facing the wall every day between 6am and 9am until the Priory is restored.